Today is the last day to enter my 1 Million Hits Bento Giveaway, so if you haven’t posted a comment yet, be sure to do so! Luckily for most of you I live at the edge of America, so it closes especially late. On Saturday, I mentioned that Baby Girl had written her name on her bed sheets. I caught her just as she was at “Watana” in Watanabe and of course, I was mad, so I made her stay in her room for a few hours to think about what she’d done. When I let her out, I noticed that in her time of pondering, she’d decided that the best thing to do was to finish what she’d started and so she tacked on the ‘be’ to the end of “Watana”. I was so flustered I just pretended I didn’t see it, lest I go crazy. When I did the pink onigiri party platter, I actually forgot my rice cooker at the office. Then on Friday I forgot it again, so I had to go a whole weekend without a rice cooker. Since I have never in my entire rice-eating life cooked rice in a regular pot, we just didn’t eat rice. This meant spaghetti on Sunday. Anyway, just something simple. I made spaghetti with hamburger and prosciutto, a whole packet of which I have to use up somehow in the next two days, hapa noodles (some regular, some whole wheat), and homemade garlic bread with a big honking baguette from Costco. I meant to bring garlic bread for lunch, but I suspect it’s been chillin’ on the couch all day after I forgot it. Hopefully it found the TiVo remote and wasn’t bored all day. In the other tier I have cubed Freska mango and whole strawberries. Strawberries are dirt cheap at Costco this week, $3.99 for a big tray. I used my Vivo Bento Box , which is awesome for color. The food took me less than ten minutes, but the flowers took me almost as long because I had to carefully poke each petal out with a toothpick before getting the whole thing out. 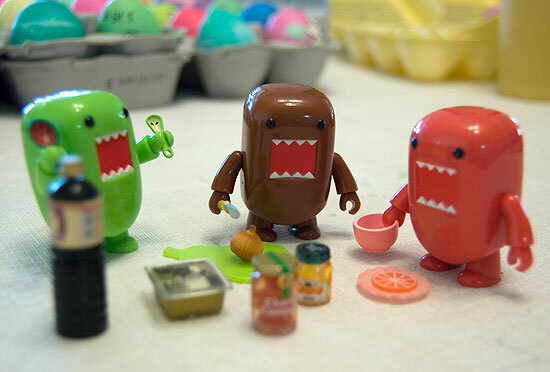 Here we have my Hoodlums having a nice picnic while we dyed eggs during Easter. They’re having a really strange meal, but what do you expect from Domokuns. Hopefully I can get back to posting Docubentory stuff, as that’s been falling drastically behind! Watch for something new tomorrow!